As Day 2 of ISM2017 comes to a close, we want to share some of the highlights from the conference over the past two days. While there are still many exciting sessions and presentations lined up for Tuesday and Wednesday, attendees have already learned so much from the last two days of experiences and educational presentations. The members of the Source One team that are attending ISM2017 are looking forward to gaining more of the already valuable takeaways they have achieved thus far at the conference. Kicking off Sunday morning, attendees had the opportunity to attend the Business Behind the Magic tour in the morning followed by Signature Sessions, networking events and other educational presentations in the afternoon. In the evening, attendees had the chance to attend Procurement Transformation: Is a GPO right for your organization? which featured a panel of executives, including Source One's VP, Operations, William Dorn. This interactive discussion allowed the audience to ask Dorn and other panel members questions about how GPOs can offer value for any organization, and the opportunities that GPO members are exposed to beyond cost savings. This session was featured on the Learning Tracks session in Bust track of the Economic Segment, that included other sessions that offered effective strategies and tactics for surviving when economic times get tough. The evening of the first day concluded with the ISM2017 Welcome Party at the World Showplace at Epcot for networking and other activities to excite attendees for the rest of the conference. 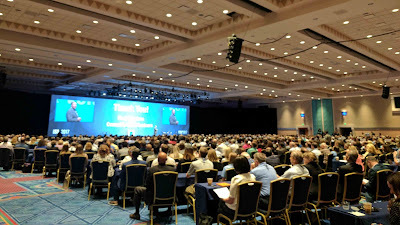 Monday began with a Keynote General Session for all audiences before executives separated from their teams for Day 1 of the exclusive sub-conference Exec In. Source One is featured as the exclusive sponsor of Exec In, that includes sessions designed for industry professionals who act as decision makers in their organizations. These sessions include Open Mic: Why Here, Why Now?, CPO Roundtable and Procurement 4.0 which featured Source One Senior Data Scientist James Patounas discussing how to prepare the industry for a world that is driven by artificial intelligence and machine learning. Day 3 of ISM2017 has attendees anticipating even more excitement, with sessions including Emerging Professionals: Should I Stay or Should I Go? that includes panel moderator and Source One Director Diego De la Garza discussing the benefits of staying with one company for the majority of one's career compared to the benefits of frequently switching companies. Stay tuned to find out more about the exciting sessions and educational experiences at ISM2017 as the Source One team reports live from Orlando for the rest of the event!